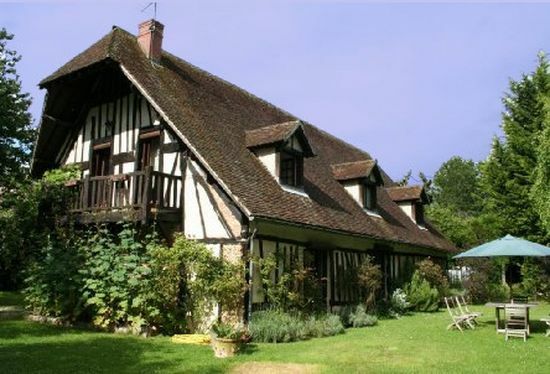 This half-timbered house is situated in Normandy, France. The traditional Norman half-timbered house was built using one of two techniques: the frame was built with four evenly-spaced regularly hewn timbers set either into the ground (poteau en terre) or into a continuous wooden sill (poteau du sole) and mortised at the top into the plate. The openings were filled with many materials including mud and straw, wattle and daub, or horsehair and gypsum.